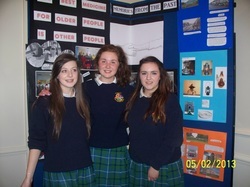 On 2nd May 2013 TY2 and TY3 students and their teachers Ms. Hetherton and Ms. Flanagan from St.Aidan’s participated in the Youth for Justice exhibition in the Nuremore Hotel Carrickmacross, Co Monaghan. The President of S.V.P welcomed everyone and explained that the aim of the programme was to harness the energy in young people so that they can work in the Community. Young people are the future volunteers for S.V.P. and it gives them an insight into the work that SVP are doing in communities across the country. He praised the students for all the creative and inspirational work they carried out throughout the year in their own locality. A guest speaker, Ms. Eimear Dolphin gave a very informative presentation on the mental health awareness and the importance of looking after your mental health. Each school set up a display board on their Social justice action project .There was time then for everyone to view the project displays. Each school gave a 3 minute presentation on their projects. TY 2 students from St. Aidan’s linked up with the Darley Day Care Centre in Cootehill. They visited the centre every Thursday morning . They took part in various art & craft activities with the elderly. But most of all there was plenty of chatting going on, as the elderly enjoyed asking about what is done at school today and comparing it with what they did when they were young. They performed a song “You’ve got a friend in me “ on the day as pictures of their time in the centre were displayed on screen behind them. TY3 students compiled a bullying information brochure for parents with useful tips and websites if their child is a victim of bullying or is a bully. This brochure was launched at the Cyber bullying awareness workshop organised by the Parents Association and a copy of the brochure was distributed to all parents of students in our School. At the Youth for Justice exhibition, the class compiled a video highlighting the effects of bullying on young people and the need for parents to watch out for signs of bullying. The projects were a great success and a sincere thanks to Ms. Attracta McNiece, the Youth Development Officer with SVP who visited the School in September and explained what the programme was all about and provided the students with advice on how to work on specific kinds of projects. So overall a very worthwhile project and we would encourage others to get involved with it next year.